William Gilbert (1544-1603), physician to Queen Elizabeth I (1533-1603) of England, used a spherical magnet, called a terrella, or "little Earth", to show why compass needles point north and south. Whenever a compass was placed on the sphere, the needle pointed to its north or south magnetic poles. As suggested by Gilbert in 1600, in his treatise, De magnete: magnus magnes ipse est globus terrestris, translated "About magnetism: the terrestrial globe is itself a great magnet", the Earth has a huge dipolar magnetic field with two poles, north and south. It's as if there were a bar magnet at the center of the planet Earth, with lines of magnetic force emerging from the south pole, looping out through the space near Earth, and re-entering at the north pole (Fig. 8.1). Ms dipolar magnetic field is generated as in a dynamo by electric currents deep within the Earth's core. Since the geographic poles are located near the magnetic ones, a compass needle at the equator points north and south, within about 12 degrees. At each magnetic pole, the compass needle would stand upright, pointing into or out of the ground. And in between, at intermediate latitudes, it would point north and south with a downward dip at one end, but not vertically as at a pole. Invisible powers collide, sometimes violently, in the vast reaches of space between the Earth and the Sun. ttere the hot, high-speed, magnetized solar wind, which continuously blows from the Sun and rushes toward the Earth, meets the Earth's magnetic field. Ms turbulent encounter occurs fairly close to home, usually at a distance of about ten times the Earth's radius. Spacecraft have shown that the terrestrial magnetic field deflects the solar wind away from the Earth and hollows out a cavity in it, forming a protective "cocoon" around the planet, ttis magnetic cocoon, called the magnetosphere, shields the Earth from the full force of the solar wind, and protects our planet from possibly lethal energetic solar particles. Even though the Earth's magnetism is several times weaker than a toy magnet, it is still strong enough to block and divert the flow of the tenuous solar wind, like a rock in a fast flowing stream of water or a building in a strong wind on Earth. FIG. 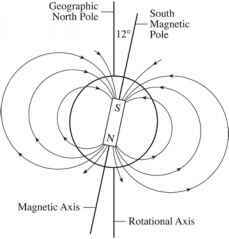 8.1 Earth's magnetic dipole The Earth's dipolar (two poles) magnetic field looks like that which would be produced by a bar magnet at the center of the Earth, with the North Magnetic Pole corresponding to the South Geographic Pole and vice versa. It originates in swirling currents of molten iron deep in the Earth's core, and extends more than 20 Earth radii, or 126,000 kilometers out into space. Magnetic field lines loop out of the South Geographic Pole and into the North Geographic Pole. A compass needle will always point along a field line. The lines are close together near the magnetic poles where the magnetic force is strong, and spread out above the equator where they are weaker. The magnetic axis is tilted at an angle ofl 1.7 degrees with respect to the Earth's rotational axis. Notice that the poles of the magnet are inverted with respect to the geographic poles, following the custom of defining positive, north magnetic polarity as the one in which magnetic fields point out, and negative, south magnetic polarity as the place where magnetic fields point in. This dipolar configuration applies near the surface of the Earth, but further out the magnetic field is distorted by the solar wind (see Fig. 8.2). Birkeland proposed that electrons from the Sun are directed by the Earth's magnetism to the polar regions where they produce auroras, demonstrating his idea in experiments with electrons and magnetic spheres, tte Austrian-born, American astrophysicist ttomas Gold (1920-2004) coined the term magnetosphere in 1959, more than half a century after Birkeland's prophetic remarks. Space probes have now encountered every major planet, showing that six of them are wrapped in their own magnetic sheathing. Mercury, Earth, Jupiter, Saturn, Uranus, and Neptune have dipolar magnetic fields of sufficient strength to deflect the solar wind and form a tear-shaped cavity called a magnetosphere, though the magnetic axes on Uranus and Neptune are tilted by large amounts from their rotation axes, ttere is no detectable magnetism on Venus, tte magnetic fields on Mars are now detected only in surface stripes of alternate magnetic polarity; they are most likely the leftover fossil remnants of a former global dipolar field. as it extends to greater distances, eventuallybecoming distorted by the Sun's wind. Far from the Earth, the term sphere in magnetosphere loses its strict geometrical meaning, and instead implies a more general sphere of influence. Out there, the solar wind takes over and continuously molds the Earth's magnetosphere into a changing, asymmetric shape (Fig. 8.2). Rarefied as it is, the solar wind still possesses the power to bend and move things in its path. It compresses and flattens the outer boundary of the magnetosphere into a blunt-nosed shape on the dayside facing the Sun; on the night side of the Earth away from the Sun, the terrestrial magnetic field is stretched out and turned inward upon itself by the relentless solar wind, forming an invisible magnetotail that always points downwind like a weather vane, tte magnetotail contains oppositely directed magnetic field lines derived from the two hemispheres of the terrestrial magnetic field, tte magnetic field lines emerging from the southern hemisphere are directed away from the Sun; those originating in the northern hemisphere are directed sunward. FIG. 8.2 Magnetosphere The Earth's magnetic field carves out a hollow in the solar wind, creating a protective cavity, called the magnetosphere. A bow shock forms at about ten Earth radii on the sunlit side of our planet. The location of the bow shock is highly variable since it is pushed in and out by the gusty solar wind. 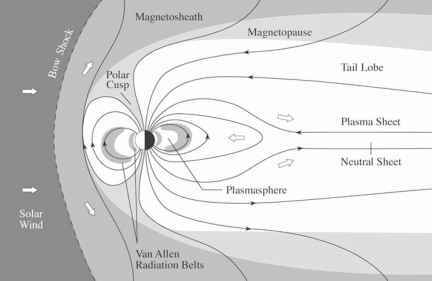 The magnetopause marks the outer boundary of the magnetosphere, at the place where the solar wind takes control of the motions of charged particles. The solar wind is deflected around the Earth, pulling the terrestrial magnetic field into a long magnetotail on the night side. Plasma in the solar wind is deflected at the bow shock (left:), flows along the magnetopause into the magnetic tail (right), and is then injected back toward the Earth within the plasma sheet (center). The Earth, its auroras, atmosphere and ionosphere, and the two Van Allen radiation belts all lie within this magnetic cocoon. the bow of a moving ship (Fig. 8.3). At the bow shock, the solar wind abruptly decelerates to subsonic speed and heats up, like the wheels of a car slamming on its brakes or an ocean wave crashing into foam at the shore. Most of the solar wind is then deflected around the Earth, but some of its particles are reflected back from the bow shock into the onrushing solar wind, like the eddies around a rock in a river. Like winds on Earth, the solar wind is punctuated by gusts and has its own tempestuous weather, which buffets the magnetosphere. When the solar wind pressure is high, the bow shock moves inward, and when the pressure drops, the Earth's magnetic domain expands; it's like squeezing a rubber ball and letting it go. 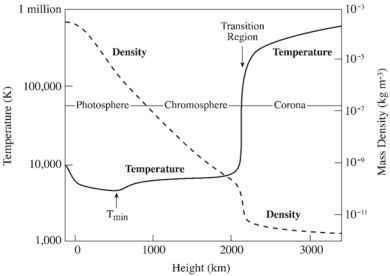 tte entire magnetosphere compresses and expands, changing size constantly as the solar wind varies in density and speed, ttese variations are frequently caused by violent eruptions on the Sun, which occur more often during the maximum in the 11-year cycle of solar activity.